With roughly 16,000 ASD students entering postsecondary institutions each year (Wei et. al, 2015) colleges and universities must understand the needs of this population and provide support to best enable success. While transitioning into college, students with ASD are likely to experience considerable stress and anxiety as they face social, academic, and personal challenges they have not encountered before. Yet there is remarkably little research regarding the experiences of ASD individuals in higher education. Identify concerns which are unique to those with ASD, as well as those which are heightened (i.e. exacerbated in those with ASD relative to non-ASD peers). Analyze the effects of identified concerns. 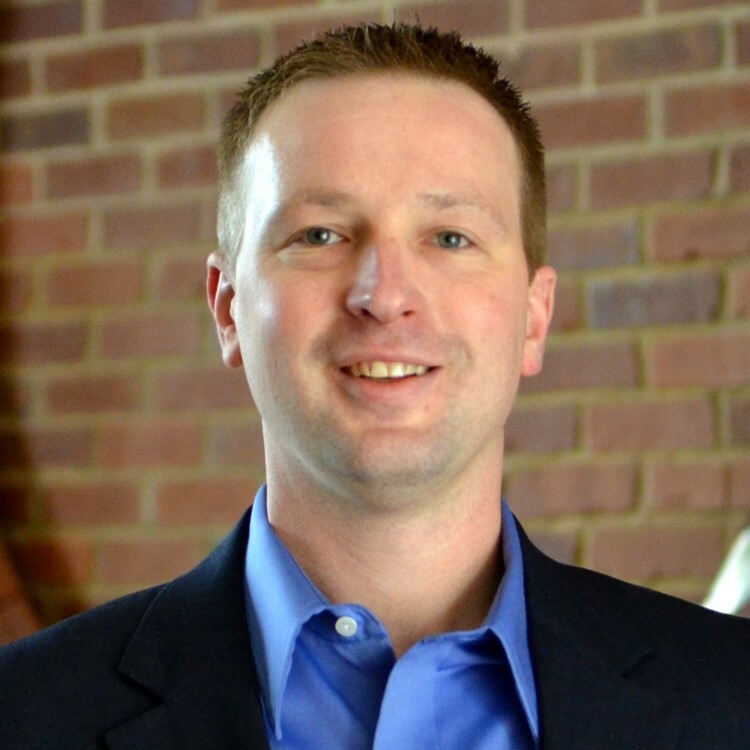 Explore methods of alleviating the concerns of these students in an impactful manner. Student testimonials related to postsecondary education were gathered from the website WrongPlanet.net, an online resource for individuals with ASD that provides support through articles, forums, and discussions. Data were collected from discussions within the “School and College Life” forum. The statements were then coded using Astin’s (1991) Inputs-Experiences-Outputs model. The second round of coding followed specific themes that were established by the first round of coding. Students’ concerns were identified by the use of words expressing feelings (i.e., fear, afraid, concern). Students commonly noted low levels of self-confidence and mental health issues (e.g. 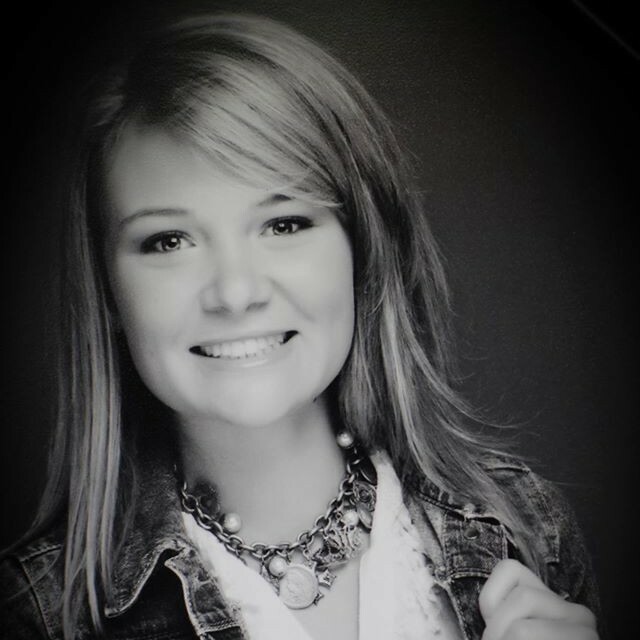 “So, how can I even begin to tell my parents in a week that I have failed… It is difficult for me not to constantly think of suicide because of this situation”). Few students indicated resolutions to their issues. Those who did resolve their concerns noted the importance of socialization (e.g. “Spend as much time developing social skills and… The school WILL NOT try to help you do this”) and access to information as routes for overcoming their concerns successfully. 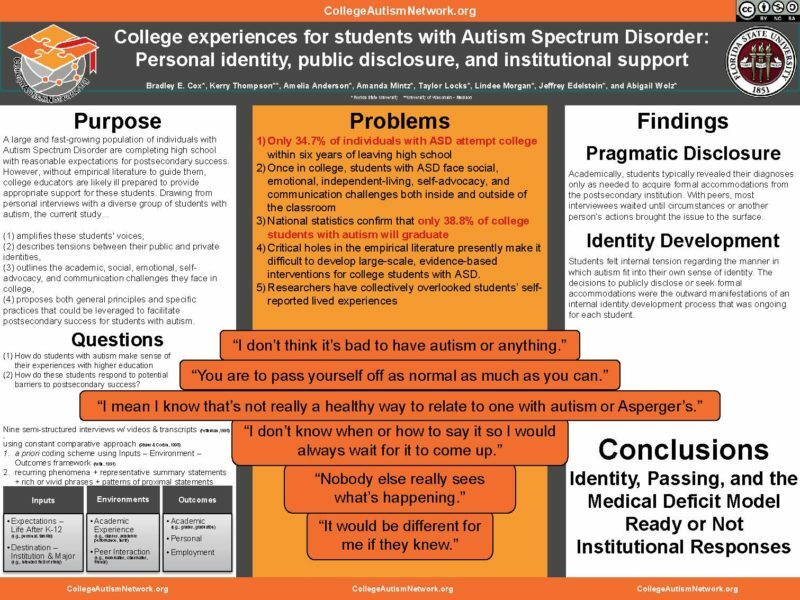 Students with ASD often do not feel supported by their colleges and universities, suggesting they may not have the same perception of higher education as their neurotypical peers. However, by addressing the specific concerns expressed by these students, higher education professionals can help these individuals assimilate into postsecondary environments and maximize their academic and developmental potential. Individuals with high functioning autism spectrum disorder (ASD), formerly diagnosed as Asperger syndrome, are graduating from high school and entering institutions of higher education (IHE) in greater numbers than ever before. Transitioning from high school to college can be challenging for all students, and can be particularly difficult for students with ASD, who often face adversity during periods of transition. Although a growing number of colleges and universities have begun developing programs to support these students, more efforts are necessary to better understand how to best serve this population. Further, much of the relevant literature relies on secondhand reporting from parents, faculty, and administration rather than the student with ASD him or herself. 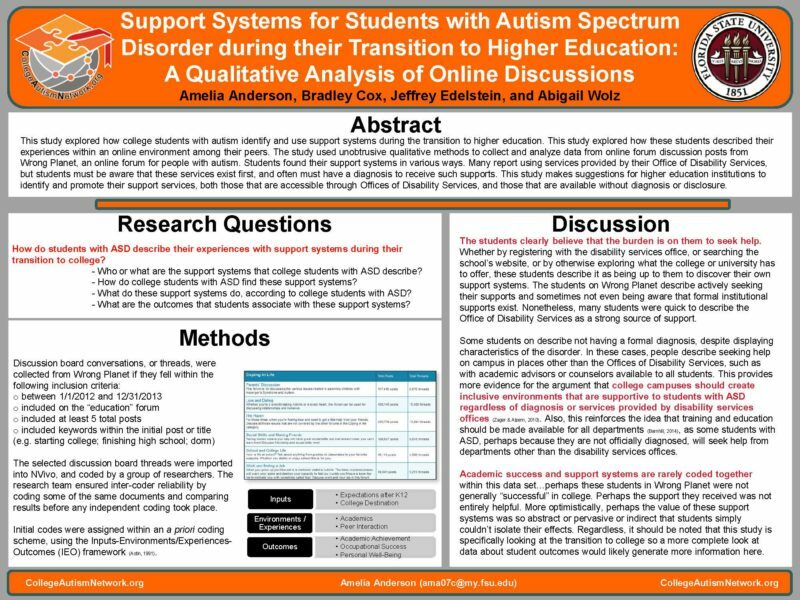 This study is an exploration into how college students with high functioning autism spectrum disorder describe their support systems during the transition to higher education. In particular, this study explores how these students describe their experiences within an online environment among their peers. The study used unobtrusive qualitative methods to collect and analyze online forum discussion posts from college students with autism spectrum disorder. Data was collected from the Wrong Planet “School and College Life” forum, which is a publicly viewable discussion forum. Source forum replies were coded into qualitative data analysis software NVivo in the first round of analysis as guided by (Astin’s) I-E-O framework. Following this, a second round of coding occurred in which specific themes were established, from which this study draws data. Institutions of higher education offer a variety of support services for students with ASD. Though services offered through ODS typically require documentation of a formal diagnosis, others are available without diagnosis or disclosure. Because some students do not have a formal diagnosis and many others choose not to disclose, colleges and universities must train faculty and staff throughout the institution to provide the support these students deserve. College students with autism face daunting social, emotional, independent-living, self-advocacy, and communication challenges both inside and outside of the classroom (Adreon & Durocher, 2007; Gobbo & Shmulsky, 2013). However, critical holes in the empirical literature make it difficult to develop low cost, high yield, evidence-based interventions to improve student grades, persistence, graduation, and subsequent employment. 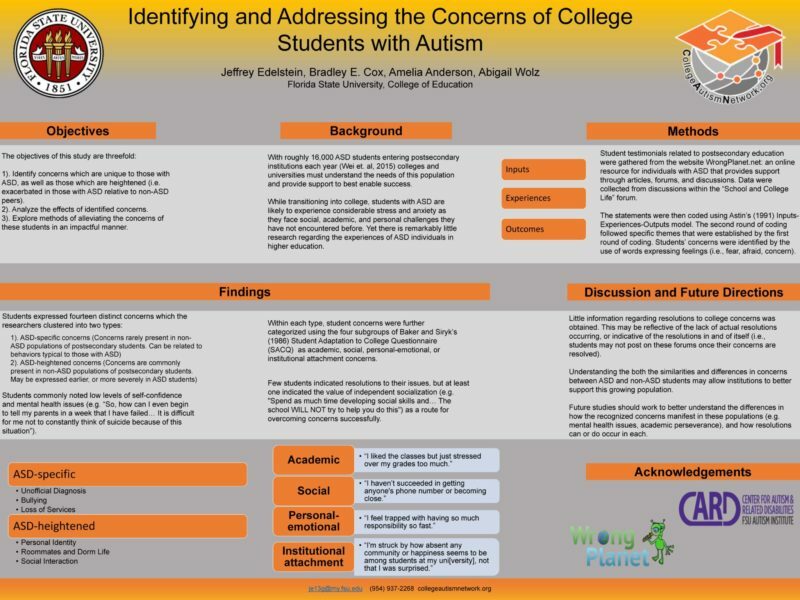 The current study begins to fill these knowledge gaps by (1) defining salient issues affecting college success for individuals with autism and (2) describing institutional initiatives with potential to promote college success for students with autism. The study’s primary research question is: How do students with autism make sense of their experiences in higher education and respond to barriers potentially limiting postsecondary success? Data for the study are drawn from interviews, following the guidelines outlined by Fetterman (1998), with nine students with a formal diagnosis of ASD. Interviews centered upon student inputs, experiences, and outcomes in higher education (Astin, 1991). For example, participants were asked to describe their initial fears about going to college and their decisions about whether to disclose their diagnosis. Analyses proceeded using a constant comparative approach (Straus & Corbin, 1998) with researchers coding data independently but meeting periodically to ensure convergence during two distinct rounds of coding. First, two of this paper’s authors used Astin’s (1991) framework as an a-prioridescriptive coding structure. The second round of coding was led by a third researcher. To confirm appropriate interpretation, two of the participating students reviewed and approved this paper. 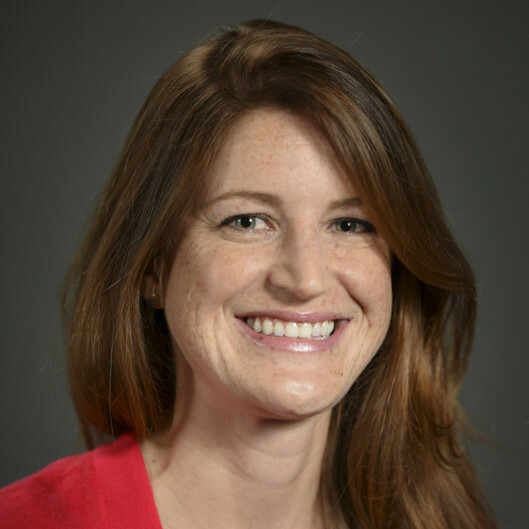 The voices of college students with ASD have generally been drowned out by the overwhelming emphasis (in the general public and scholarly literature) on young children and early interventions. This study amplifies their voices and empowers individuals with ASD to self-advocate as they consider opportunities for continued educational advancement. Now professionals working in postsecondary education must listen to these voices and act on behalf of the growing number of college students with autism. 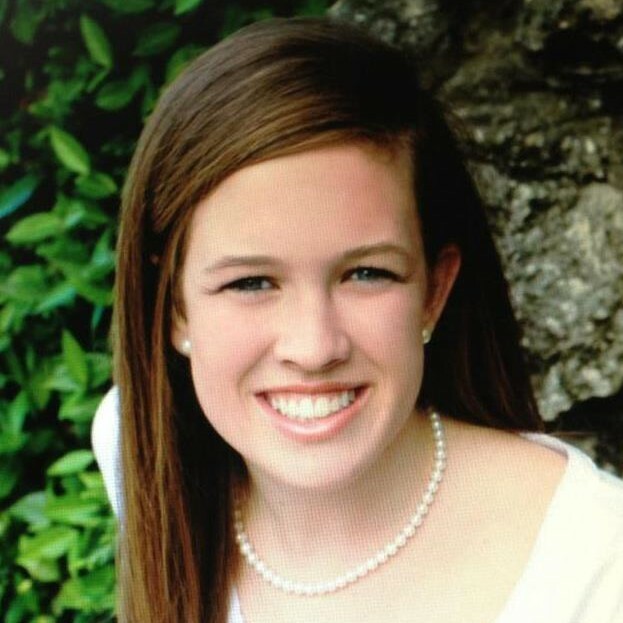 The traditional college setting is being challenged as students on the autism spectrum enter postsecondary education. This presents trials for students with ASD, as “failure by universities to provide social supports would substantially impair the student’s ability” to reach the goals of developing social skills and forming relationships (VanBergeijk, Klin,& Volkmar, 2008). One method of providing resources is the provision of formal and informal ‘safe spaces’ on campus to accommodate students with ASD, where they can self-regulate and feel prepared to accomplish the aforementioned objectives. Such spaces help students overcome potential barriers to academic and social engagement, thereby facilitating students’ growth and success. 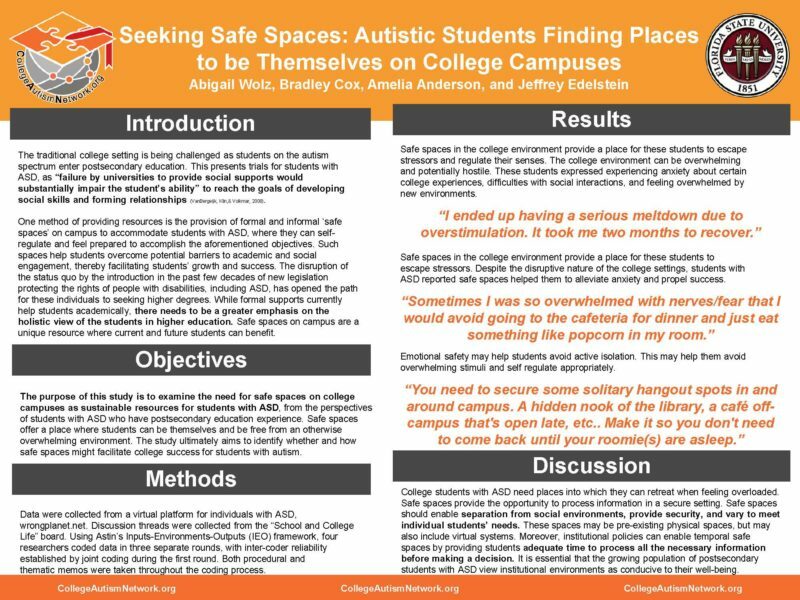 The purpose of this paper is to examine the need for safe spaces on college campuses as sustainable resources for students with ASD, from the perspectives of students with ASD who have postsecondary education experience. Safe spaces offer a place free from an otherwise overwhelming environment. Data were collected from a virtual platform for individuals with ASD, wrongplanet.net. Discussion threads were collected from the “School and College Life” board. Using Astin’s Inputs-Environments-Outputs (IEO) framework, four researchers coded data in three separate rounds, with inter-coder reliability established by joint coding during the first round. Both procedural and thematic memos were taken throughout the coding process. College students with ASD need places into which they can retreat when feeling overloaded. Safe spaces provide the opportunity to process information in a secure setting. Safe spaces should enable separation from social environments, provide security, and vary to meet individual students’ needs. These spaces may be pre-existing physical spaces, but may also include virtual systems. Moreover, institutional policies can enable temporal safe spaces by providing students adequate time to process all the necessary information before making a decision. It is essential that the growing population of postsecondary students with ASD view institutional environments as conducive to their well-being. The creation of safe spaces is one promising means of doing so. The International Meeting for Autism Research (IMFAR) is an annual scientific meeting, convened each spring, to exchange and disseminate new scientific progress among ASD scientists and their trainees from around the world. To learn more, go to http://www.autism-insar.org/.